Here’s what to expect during the major phases of construction. Building your new home is exciting, especially when you understand how the process works. 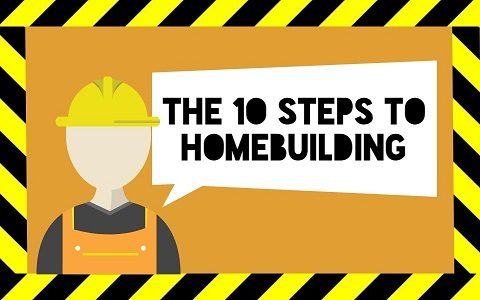 The following overview outlines the typical steps your builder will take in the construction of a home and will help keep you abreast of what happens at key stages. Keep in mind that the homebuilding process may vary from region to region and builder to builder, especially if you’re building an elaborate custom home. Be sure to ask your builder about his or her specific policies and procedures. 1. 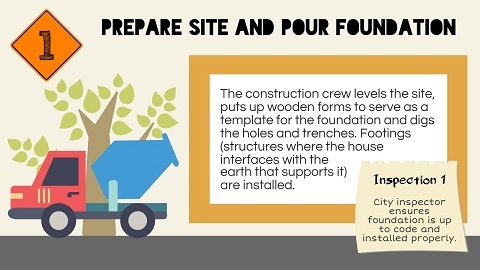 Prepare site and pour foundation: Often, site preparation and foundation work are performed by the same crew, but this may not be the case with a wooded lot. Using a backhoe and a bulldozer, the crew clears the site of rocks, debris and trees for the house and, if applicable, the septic system. The crew levels the site, puts up wooden forms to serve as a template for the foundation, and digs the holes and trenches. Footings (structures where the house interfaces with the earth that supports it) are installed. If your home is going to have a well, it will be dug at this point. If the home has a full basement, the hole is dug, the footings are formed and poured, and the foundation walls are formed and poured. If it’s slab-on-grade, the footings are dug, formed and poured; the area between them is leveled and fitted with utility runs (e.g. plumbing drains and electrical chases); and the slab is poured. Once concrete is poured into the holes and trenches, it will need time to cure. During this period, there will be no activity on the construction site. After the concrete is cured, the crew applies a waterproofing membrane to the foundation walls; installs drains, sewer and water taps and any plumbing that needs to go into the first-floor slab or basement floor; and backfills excavated dirt into the hole around the foundation wall. INSPECTION #1: When the curing process is complete, a city inspector visits the site to make sure foundation components are up to code and installed properly. This inspection may be repeated depending on the type of foundation (slab, crawl space or basement). Your builder will then remove the forms and begin coordinating step 2, the framing phase. 2. Complete rough framing: The floor systems, walls and roof systems are completed (collectively known as the shell or skeleton of the house). Plywood or oriented strand board (OSB) sheathing is applied to the exterior walls and roof, and windows and exterior doors are installed. The sheathing is then covered with a protective barrier known as a house wrap; it prevents liquid water from infiltrating the structure, while allowing water vapor to escape. This reduces the likelihood of mold and wood rot. 3. Complete rough plumbing, electrical and HVAC: Once the shell is finished, siding and roofing can be installed. At the same time, the electrical and plumbing contractors start running pipes and wires through the interior walls, ceilings and floors. Sewer lines and vents, as well as water supply lines for each fixture, are installed. Bathtubs and one-piece shower/tub units are put in place at this point because there’s more room to maneuver large, heavy objects. Ductwork is installed for the heating, ventilation and air-conditioning (HVAC) system, and possibly the furnace. HVAC vent pipes are installed through the roof, and insulation is installed in the floors, walls and ceilings. After the roofing goes on, the house is considered “dried in.” The electrician then installs receptacles for outlets, lights and switches and runs wires from the breaker panel to each receptacle. Wiring for telephones, cable TV and music systems is included in this work. 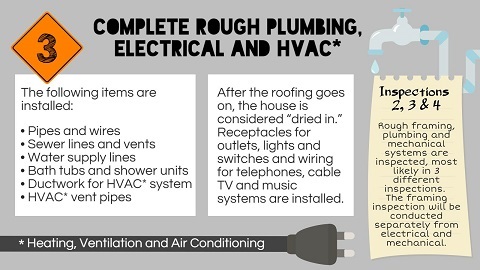 Note that HVAC ducts and plumbing are usually installed before wiring, because it’s easier to run wires around pipes and ducts than vice versa. INSPECTIONS 2, 3 and 4: Rough framing, plumbing and electrical and mechanical systems are inspected for compliance with building codes. Most likely these will be three different inspections. At the very least, the framing inspection will be conducted separately from the electrical/mechanical inspections. At this stage, drywall (also known as plasterboard, wallboard or gypsum board) is delivered to the building site. Sheetrock®, a registered trademark of USG Corporation, is sometimes used as a generic term for drywall. 4. 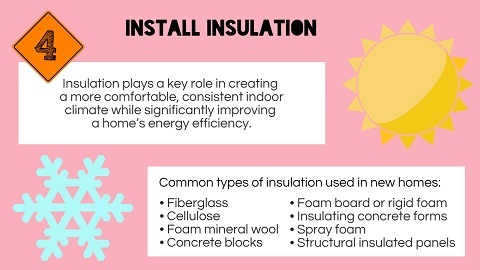 Install insulation: Insulation plays a key role in creating a more comfortable, consistent indoor climate while significantly improving a home’s energy efficiency. One of the most important qualities of insulation is its thermal performance or R-value, which indicates how well the material resists heat transfer. Most homes are insulated in all exterior walls, as well as the attic and any floors that are located above unfinished basements or crawl spaces. The most common types of insulation used in new homes are fiberglass, cellulose and foam. Depending on the region and climate, your builder may also use mineral wool (otherwise known as rock wool or slag wool); concrete blocks; foam board or rigid foam; insulating concrete forms (ICFs); sprayed foam; and structural insulated panels (SIPs). Blanket insulation, which comes in batts or rolls, is typical in new-home construction. So is loose-fill and blown-in insulation, which is made of fiberglass, cellulose or mineral-wool particles. Another insulation option, liquid foam, can be sprayed, foamed-in-place, injected or poured. While it costs more than traditional batt insulation, liquid foam has twice the R-value per inch and can fill the smallest cavities, creating an effective air barrier. Fiberglass and mineral-wool batts and rolls are usually installed in side walls, attics, floors, crawl spaces, cathedral ceilings and basements. Manufacturers often attach a facing such as kraft paper or foil-kraft paper to act as a vapor barrier and/or air barrier. In areas where the insulation will be left exposed, such as basement walls, the batts sometimes have a special flame-resistant facing. 5. 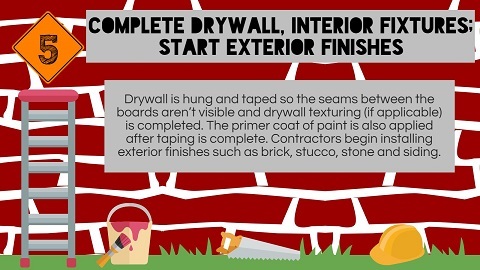 Complete drywall and interior textures; start exterior finishes: Drywall is hung and taped so the seams between the boards aren’t visible, and drywall texturing (if applicable) is completed. The primer coat of paint is also applied after taping is complete. Contractors begin installing exterior finishes such as brick, stucco, stone and siding. 6. 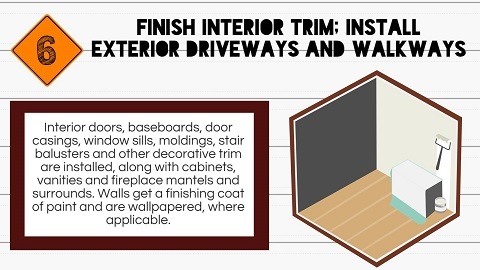 Finish interior trim; install exterior driveways and walkways: Interior doors, baseboards, door casings, window sills, moldings, stair balusters and other decorative trim are installed, along with cabinets, vanities and fireplace mantels and surrounds. Walls get a finish coat of paint and are wallpapered where applicable. Generally, exterior driveways, walkways and patios are formed at this stage. Many builders prefer to wait until the end of the project before pouring the driveway because heavy equipment (such as a drywall delivery truck) can damage concrete. But some builders pour the driveway as soon as the foundation is completed so that when homeowners visit the construction site, they won’t get their shoes muddy. 7. 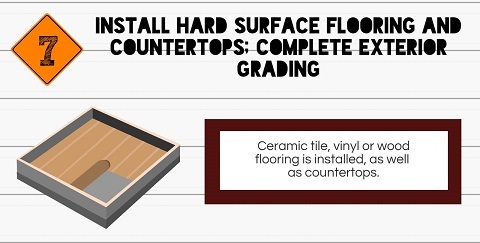 Install hard-surface flooring and countertops; complete exterior grading:Ceramic tile, vinyl and wood flooring are installed as well as countertops. Exterior finish grading is completed to ensure proper drainage away from the home and prepare the yard for landscaping. 8. 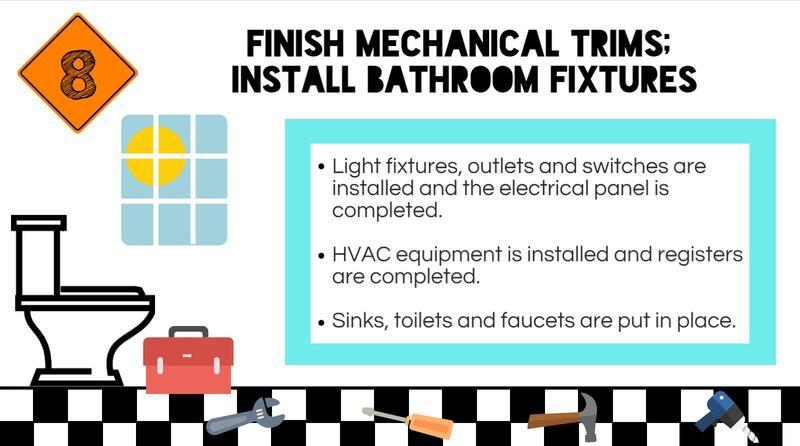 Finish mechanical trims; install bathroom fixtures: Light fixtures, outlets and switches are installed and the electrical panel is completed. HVAC equipment is installed and registers completed. Sinks, toilets and faucets are put in place. 9. 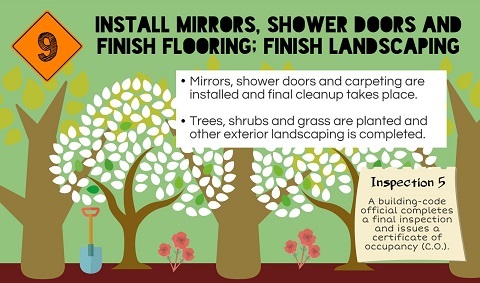 Install mirrors, shower doors and finish flooring; finish exterior landscaping: Mirrors, shower doors and carpeting are installed, and final cleanup takes place. Trees, shrubs and grass are planted and other exterior landscaping completed. INSPECTION #5: A building-code official completes a final inspection and issues a certificate of occupancy (C.O.). If any defects are found during this inspection, a follow-up inspection may be scheduled to ensure that they’ve been corrected. 10. 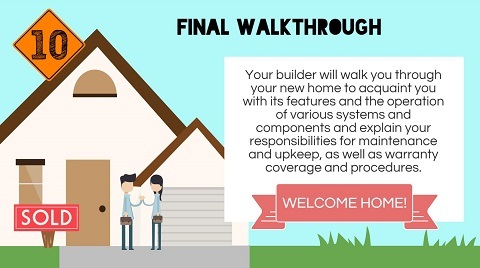 Final walkthrough: Your builder will walk you through your new home to acquaint you with its features and the operation of various systems and components, and explain your responsibilities for maintenance and upkeep as well as warranty coverage and procedures. This is often referred to as a pre-settlement walkthrough. It’s also an opportunity to spot items that need to be corrected or adjusted, so be attentive and observant. Examine the surfaces of countertops, fixtures, floors and walls for possible damage. Sometimes disputes arise because the homeowner discovers a gouge in a countertop after move-in, and there’s is no way to prove whether it was caused by the builder’s crew or the homeowner’s movers. A Few Words about Inspections: Your new home will be inspected periodically during the course of construction. In addition to mandated inspections for code compliance, your builder may conduct quality checks at critical points in the process. (In the story above, we point out when these inspections typically take place.) The idea is to catch as many potential problems as possible before construction is finished, though some issues may not surface until you’ve lived in the home for a period of time. Talk to your builder early on about attending inspections, with or without your real-estate agent. Even if your presence is not required, it’s an opportunity to learn more about what’s behind the walls of your new home and how everything works. If you’re planning to hire your own inspector to do an additional review of the home, notify your builder prior to the start of construction. For safety as well as logistical reasons, builders discourage customers from dropping in unannounced at the construction site. If you’d like to pay a visit, be sure to arrange it in advance. Chances are your builder will conduct regular walkthroughs to bring you up to speed on the progress of the work. Working with the builder who’ll construct your new home is the fifth of six steps to your new home. Here in our New Home Guide, you’ll find helpful and inspiring articles, slideshows and videos that will make your new home journey easier and more rewarding. Learn about the six key steps to your new home: Get expert advice from leading real estate writers, builders and recent new homebuyers in our New Home Guide. We’ve made it easy to follow six simple steps to your new home that include: new home 101; shopping online and in model homes; buying, financing and insuring your home; working with a builder to design and construct your home; and settling in to enjoy it. Savannah, GA June 1, 2015-Konter Quality Homes, homebuilder in Savannah, GA, has been awarded a 2015 Guildmaster Award for exceptional customer service. GuildQuality, an independent customer satisfaction surveying company, has powered the Guildmaster Award since 2005 to celebrate service excellence in the building, remodeling, contracting, and home services professions. Konter Quality Homes was selected as one of the over 300 North American builders, remodelers, developers, and contractors recognized by GuildQuality for their superior delivery of customer care. Over the past few months, GuildQuality reviewed numerous survey responses submitted by customers of Guildmaster candidates. In granting awards, GuildQuality considers two primary metrics for each candidate: the percentage of customers who would recommend and the percentage of customers who responded. Konter Quality Homes achieved a recommendation rate of greater than 90% from their customers, who were surveyed through GuildQuality. For more on the 2015 Guildmaster Award and qualifications, visit www.guildquality.com/guildmaster/. May 13, 2015 – Konter Development Company recently announced plans to develop a historic piece of land located in the Bonna Bella area directly off of Laroche Avenue. Traditionally known as the German Country Club, the waterfront property was purchased by its previous owners in 1918, and has operated as a social gathering place for many renowned Savannah families over the last century. Bluffside at Country Club Creek consists of over 20 acres of lush landscape with panoramic views of Country Club Creek which leads directly into the Herb River. Konter Development Company plans to develop the site into a new residential neighborhood, which will entail 7 waterfront home sites, 1 marsh front home site, and 58 interior lots. With respect to the German Country Club’s commitment to family and community oriented activities, the neighborhood, which has been designated as Bluffside at Country Club Creek, will include multiple amenities including an community fishing pier, activity center, and community green and playground. Konter Development Company has compiled a team of experts to ensure the development of the property pays homage to its history while adding a new market of housing for potential buyers in an ever growing area of Chatham County. The architectural design of homes within Bluffside at Country Club Creek will be similar to other residential projects the company has completed in neighborhoods such as Palmetto Row and Tabby Village, both located within Sandfly, adjacent to Isle of Hope. Wide front porches, authentic shutters, and craftsmen exterior details are just a few examples of the detailed craftsmanship that will be consistent components of each residence. With over 50 years of experience in the real estate and construction industry Jerry Konter feels this was an extremely rare opportunity for his company and his family, which includes three generations who currently work with Konter. “As a multi-generational Savannah family business we are excited to develop this unique and wonderful property, with an eye to its history and a vision for its legacy,” says Jerry Konter, President of Konter Development Company. Construction will start within the next three months, and the seven waterfront lots located along Country Club Creek are now available for reservations through Konter Development Company. For additional information on Bluffside at Country Club Creek, please contact Mark Konter at 912-341-4865. Founded by Jerry Konter in 1977, Konter Quality Homes continues a family tradition of over 50 years in the Savannah Real Estate industry. Our longevity is anchored by three generations of Konters, each with a total commitment to our customer’s satisfaction. The Konter commitment to Quality has resulted in the creation of 27 communities, 2,300 homes, and numerous prestigious awards. For more information, please see www.konterhomes.com or contact us at 912.341.4865. Majority of Americans still view owning a home as positive! The Washington Post has an interesting column today regarding a poll conducted this week to gauge American’s view on housing. Interestingly, a large majority of those polled view homes as a good long term investment, and still strive towards a goal of home ownership. You can read the column here. Konter Quality Homes, a leading homebuilder in Savannah, GA, announced today that the company has been awarded a 2011 Guildmaster Award for exceptional customer satisfaction. Konter Quality Homes was one of 154 home builders, remodelers, developers and contractors throughout North America recognized for their superlative performance. Founded by Jerry Konter in 1977 Konter Quality Homes continues a family tradition of over 50 years in the Savannah Real Estate industry. Our longevity is anchored by three generations of Konters, each with a total commitment to our customer’s satisfaction. North America’s best builders, remodelers, contractors and real estate developers rely on GuildQuality’s customer satisfaction surveying to help them monitor and improve the quality of their service. Once a year, GuildQuality recognizes exceptional customer service with the Guildmaster Awards. Visit the Guildmaster section of the GuildQuality website to see information about all 2011 Award Winners and read about the award qualifications. The 30th annual Southern Home Show is almost here! The event takes place April 1st-3rd at the Savannah International Trade and Convention Center and Konter Quality Homes is proud to be a participant. The Southern Home Show is coastal Georgia’s premier event showcasing builder, re-modelers, and contractors. This year’s event is dedicated to the military and all active duty military get in free with ID. The show also includes a military fashion show, celebrity kitchen featuring 5 of Savannah’s most loved chefs, and an encore performance by Dancing with Savannah Stars paticipants. For more information of the show please visit www.homebuildersofsavannah.com. Rock and Roll Marathon coming to Savannah! Rock an Roll Marathon, the premier marathon event in the country is coming to Savannah!! Beautiful Savannah GA will host the exciting event on November 5th.If you like to run, make your plans now to experience the intrigue and ambiance of the city while running to the beat of rock, country, jazz and blues. Free concerts will run all day during both the 1/2 and full marathon as well after the event is complete.